There is a question that trouble many believers: "Why am I not experiencing more joy, more hope, more satisfaction, more intimacy, more power, more everything in my Christian life didn't Jesus promise that?" He did promise that but too many people are trapped by the curse of "the ordinary." They have accepted the wrong idea that following God means losing individuality, creativity, and passion for achieving lofty goals. 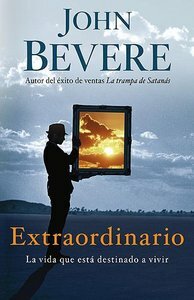 Nothing could be further for the truth John Bevere builds a convincing case, straight from Scripture, for a way of living marked by extraordinary experiences and accomplishments the life God always intended for his children. Here's a guide to understanding God's incredible plans, and how to enjoy a life where he adds the "extra" to the "ordinary."